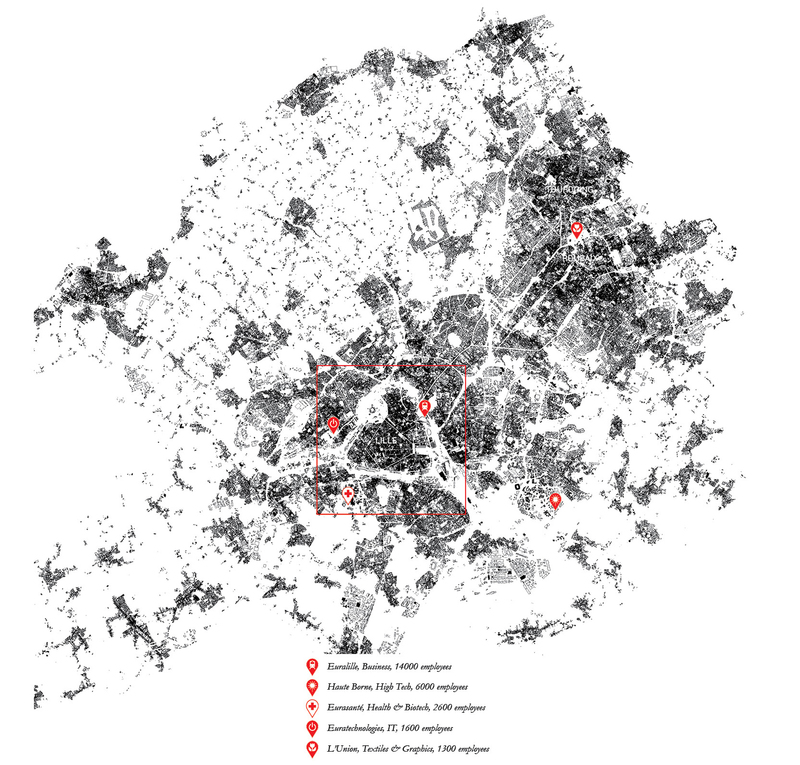 In the broadest sense, this work examines how the development of Lille’s tertiary economy has affected its urban form, and vice versa. This process has only been underway for the last 50 years, as Lille has attempted to lift itself out of an industrial downturn following a proud and thriving textile manufacturing past. As such, while Lille’s neighbours, London and Paris, are historically global hubs of knowledge industries, Lille is new to this game. It has had to depend on far-sighted, and strong political leadership to reach its current measure of success. But while projects such as Euralille have cemented its status as regional capital, international significance (and with it investment) still alludes the city. Lille’s transformation has not been a resounding success, but nor is it a failure. It is in this indeterminacy that this project attempts to find its agency. In many cities throughout the world, the import of foreign capital through the relocation of businesses is a major focus for mayors looking to improve the standing of their city. The availability of Greenfield and ex-Industrial land is often a prerequisite, ensuring newly-arrived businesses crystallise their resettlement with customised architecture. This places cities in a race to the bottom to provide the most business-friendly environment. 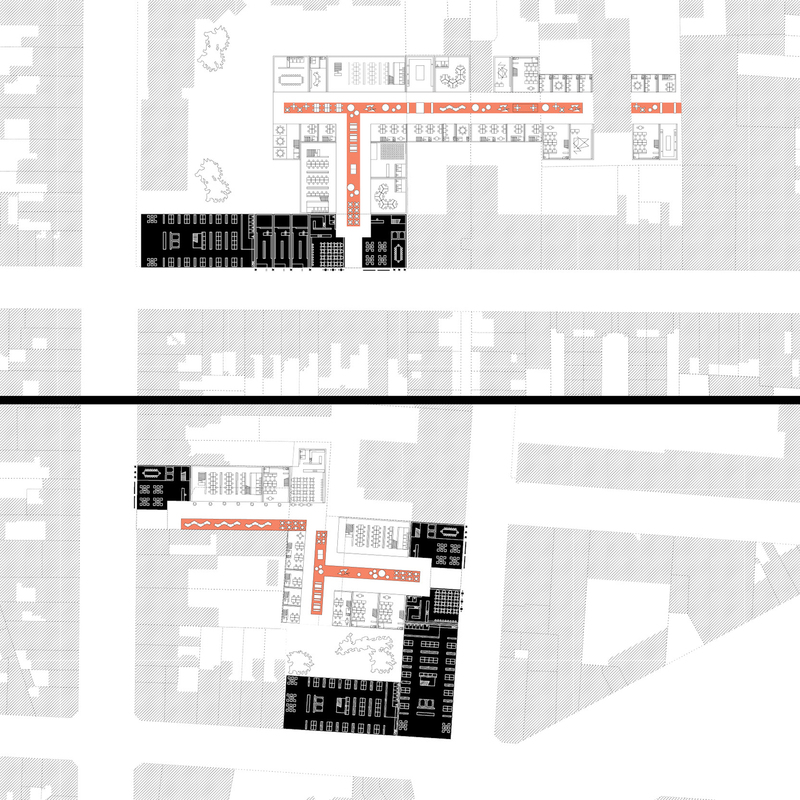 In Lille this phenomenon has resulted in new business clusters that are largely incongruent with the existing urban fabric, as cheap land and formal freedom trump the high-amenity yet spatially-limited old town. However, the compromises thought necessary to attract international capital have not succeeded, and in fact reduced the quality of the city fabric and with it Lille’s quality of life. 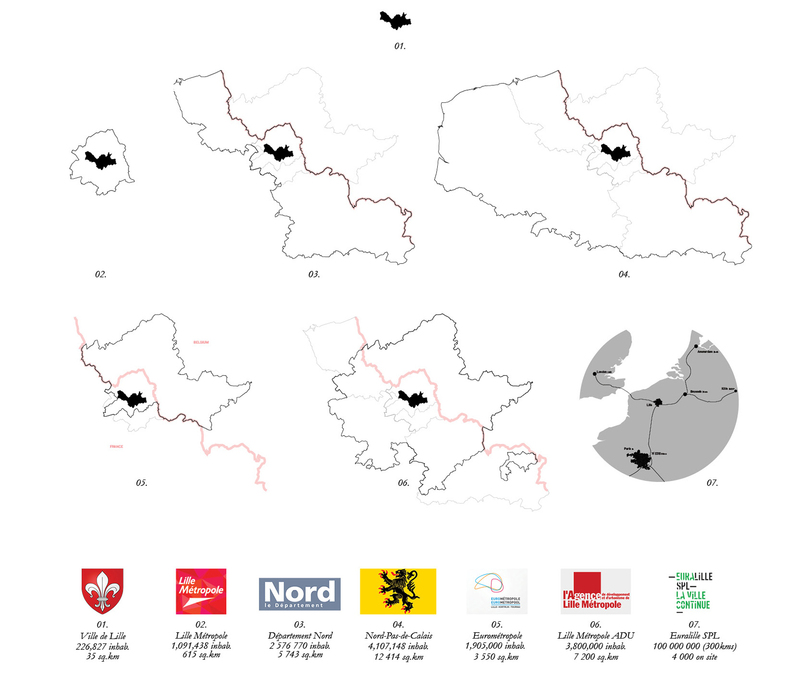 What if Lille swallowed a rather bitter pill and accepted that at an international level it is not a hub, but a periphery: the city-suburb of not one, but three European capitals. Given current trends in the workplace, it appears that the growth of Lille’s tertiary economy depends more on attracting individual workers than corporations. Therefore Lille should compete less on business friendliness than on quality of life. Promisingly, this approach does not hinge on the relocation of businesses (though of course benefits from it), as both Brussels and Paris are a viable commute. London can be reached at a stretch. Certainly the approach of Euralille SPL, and behind it the state, seems to have moved in the quality of life direction, as evidenced by the significant difference between Euralille Phase 01, and the Bois Habité and Saint Sauveur developments. Vie Quotidian over Ville Radieuse. Traditionally, Lille has been considered peripheral in France, which was somewhat appropriate for its industrial economy. 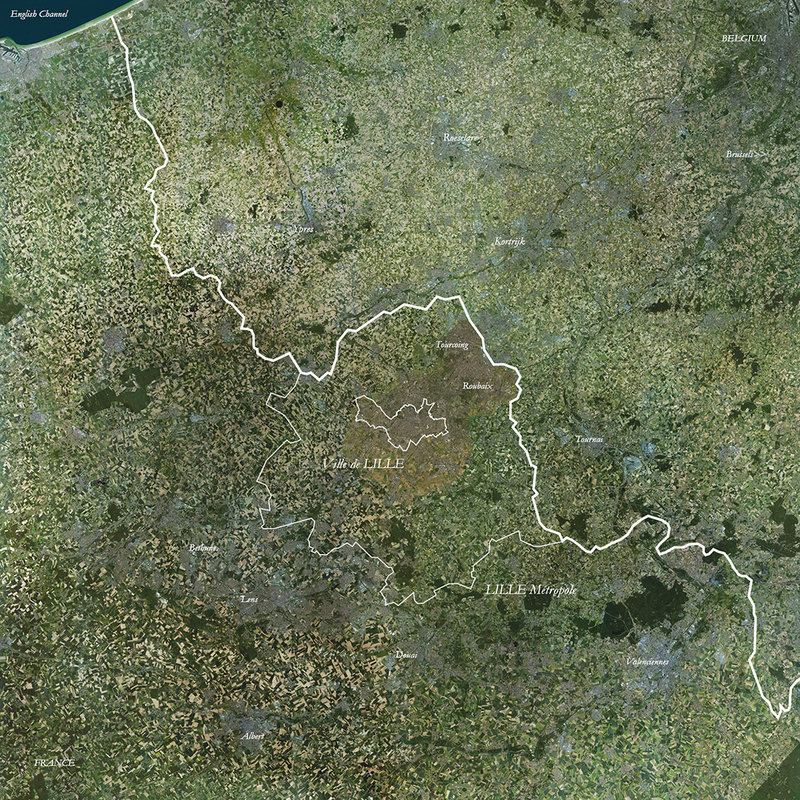 However while Lille is peripheral nationally, it is the capital of four regional territories. It is also the ideological home of the French Socialist Party, who are currently in office through both Lille’s Mayor, Martine Aubry and nationally. Lille’s most signifi cant political delineations are French. 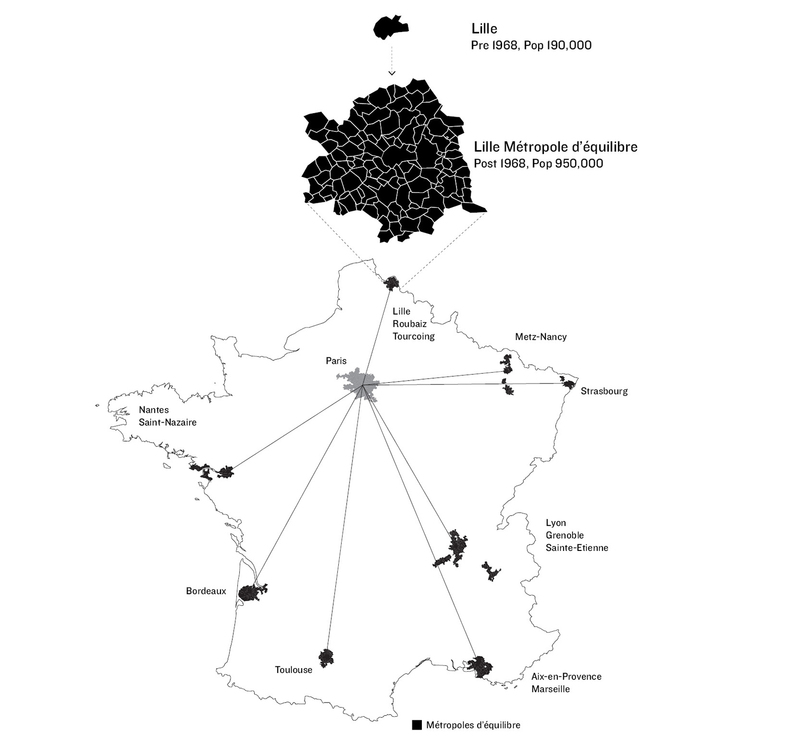 Lille’s strategic location in Europe has made it an important territory in confl icts right up until World War 2. Nowadays, it sits at the heart of the economically-dominant North-Western region of Europe. Five European capitals are located within a 300km radius. The Euralille project (TGV+Tunnel) was the most poignant manifestation of this geographical advantage. Two cooperative cross-border organisations exist to manage urban development at a regional level. In 1964, the French National Government established eight Métropoles d’Équilibre in order to rebalance the disproportionate effect of Paris on the French economy. Most cities were chosen for existing signs of growth and to these Lille was an exception as its industrial economy was in decline. However, its favourable geographical position was noted in its selection. 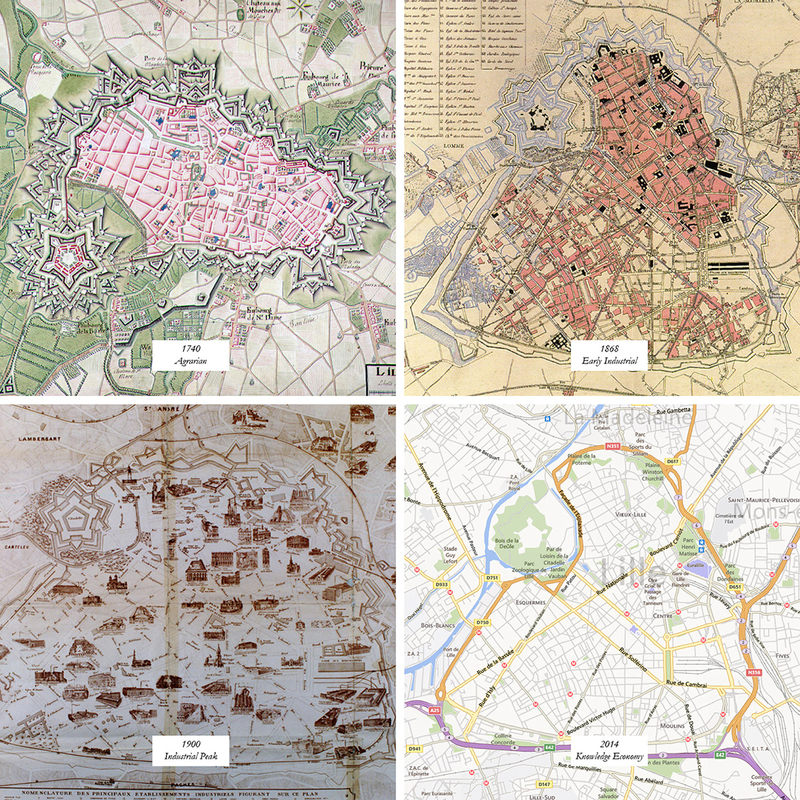 The result of this new status was the grouping of dozens of communes into a single metropolitan administrative boundary that today makes Lille Metropole the fi fth-largest in France. Euralille (Business). Euralille is a cluster of offices consisting of mostly service-industry businesses that benefit from fast access to Paris. It includes banks, insurance agencies, finance and regional headquarters. It is France’s third-largest business quarter. Haute Borne (High Tech). Haute Borne is a concentration of R&D and high technology businesses. It is intended to prioritise cross fertilisation between laboratories and enterprise. It is coupled with Lille University 01 Science. Eurasanté (Health & Biotech). Eurasanté is Europe’s largest hospital/campus quarter. Its innovation focus is health, nutrition and biotechnology. L’Union (Eco, Textiles & Multimedia). 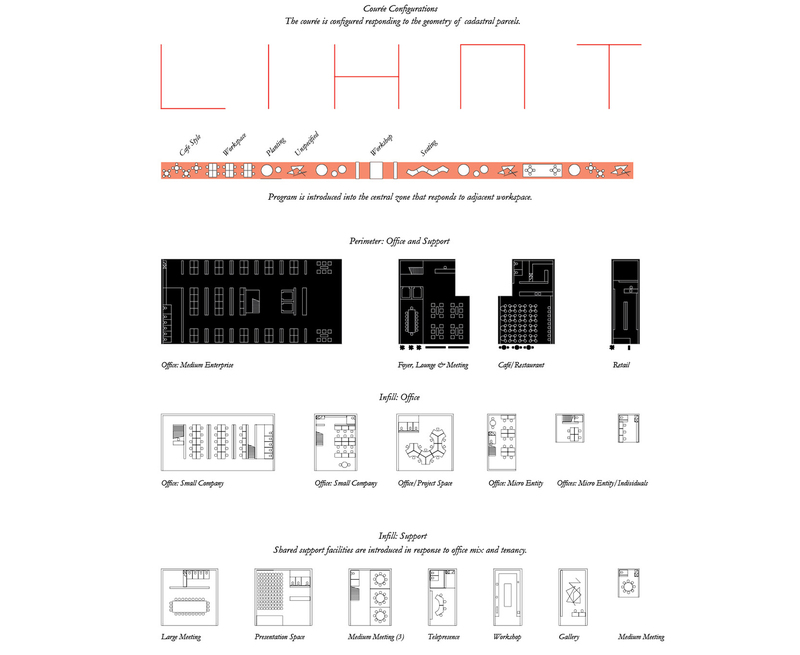 When complete, L’Union is intended to house the European Centre for Textile Innovation (CETI) which is a modern incarnation of Lille’s past industrial prowess. Located alongside this will be businesses related to imaging, video games and multimedia. Euratechnologies (Digital Startups & Accelerator). A successful IT startup space that includes incubator, accelerator, business hotel and conference space, with a global partner from government. Understanding the growth of Lille aids in understanding the signifi cance of the traces left on the city by previous eras. 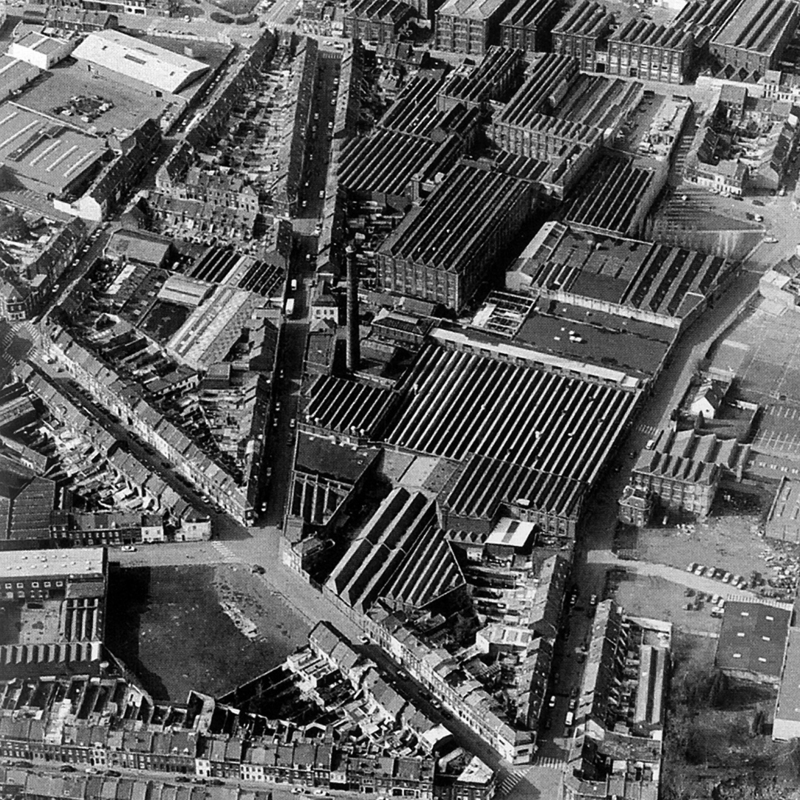 Both military fortifi cations, and the industrial era have had a signifi cant impact on the city’s contemporary form. Courées: Working-class Housing. In Lille’s industrial heyday, the working class lived in a type of housing unique to Flanders called the Courée. Haute Borne. High Tech. Haute Borne was Lille’s first tertiary sector business park. It has a similar urban form to Eurasanté, another prominent example not studied here. Euralille. Business. Euralille put Lille back on the international map. 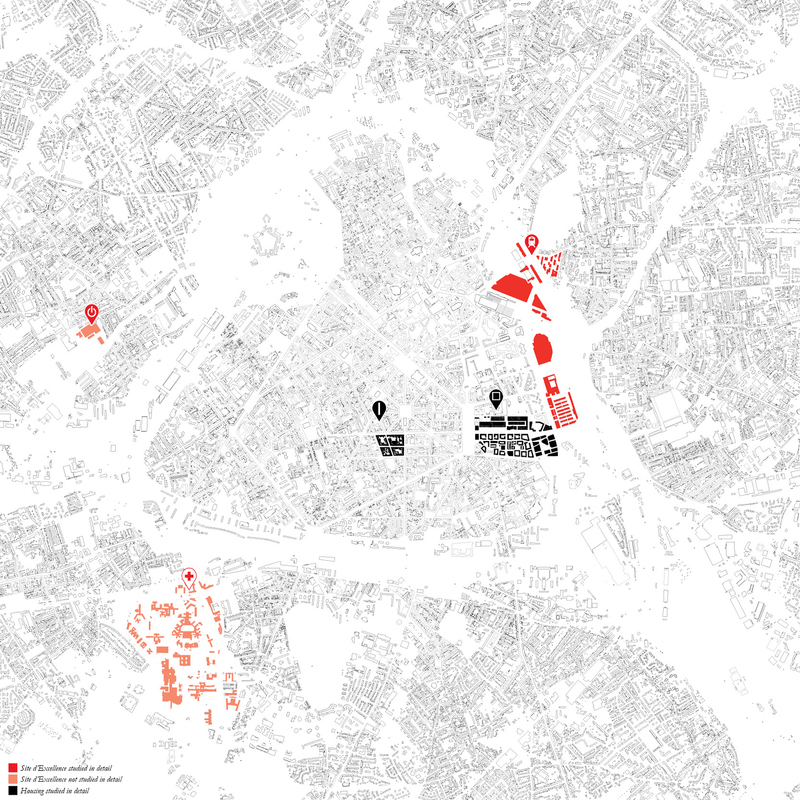 It was masterplanned by OMA and is France’s third-largest business quarter. 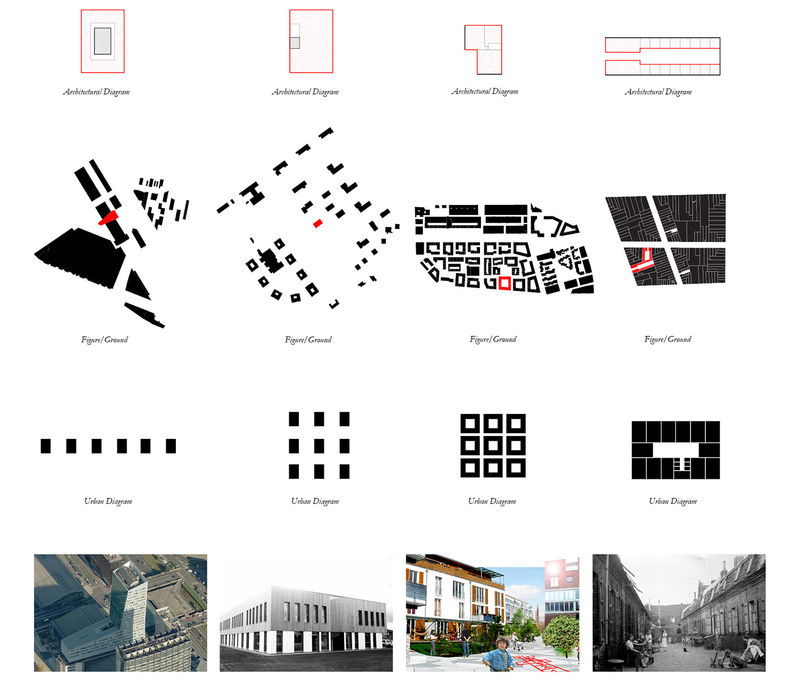 To frame a short design excercise, the two Fundamental Types that relate to business have been been considered in regards to the following question: How might the Office Tower and the Dom-ino Office be incorporated into Lille’s historical fabric? The Courée, another Fundamental Type, is identified as potentially serving as a model, albeit itself transformed. 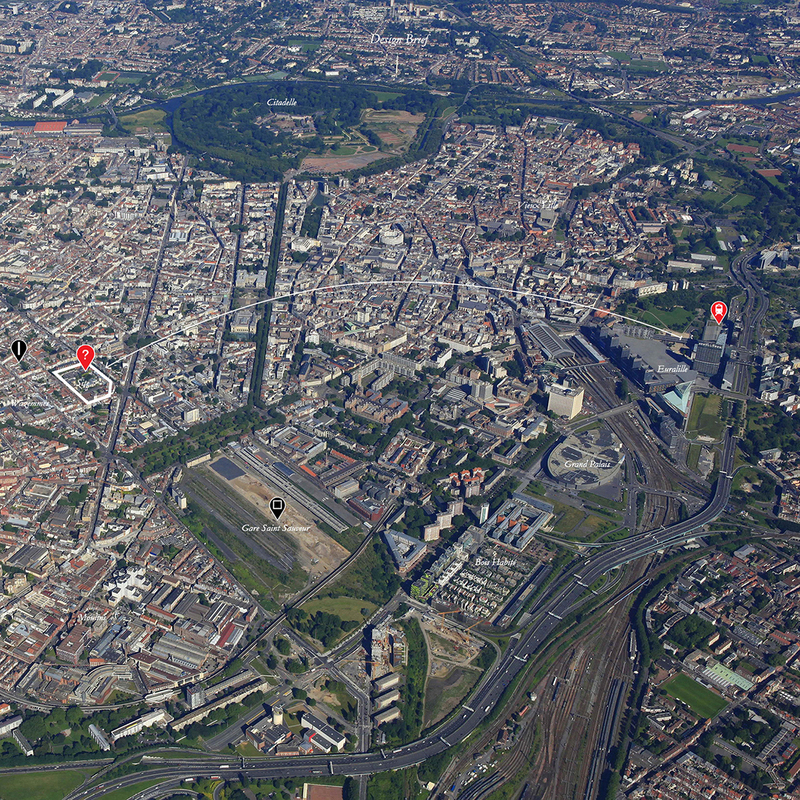 The goal is to create a form of office cluster for SME’s that can sit within Lille’s old town. 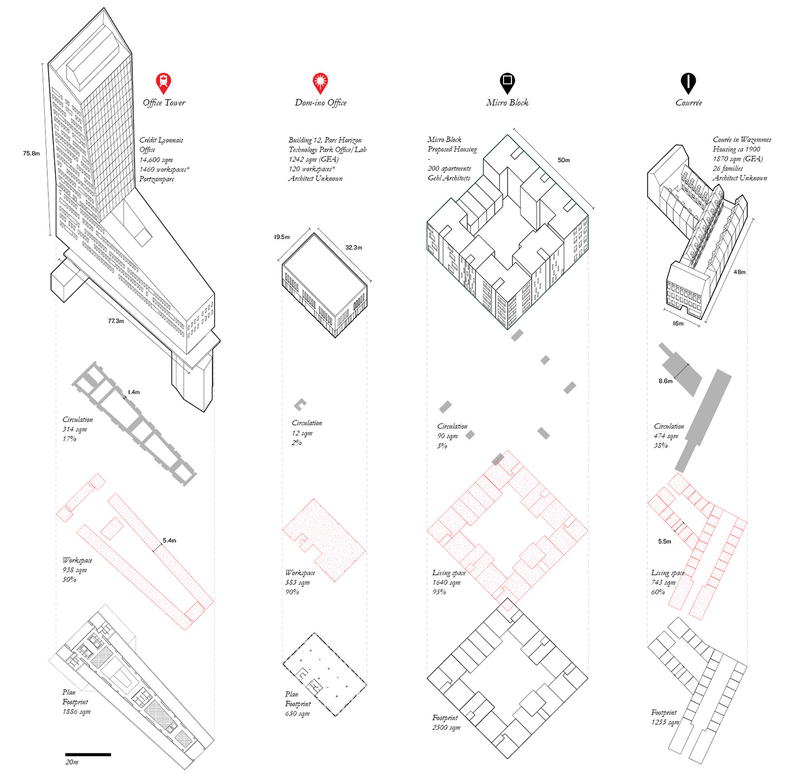 • Must be within existing urban fabric. • Must be based on the purchase of up to 10 cadastral parcels. • Must be in the interior of the block, with maximum three parcels as the entry. • Must contain all examples given above of SME’s from Individual to Medium Enterprise. • All units must front on to circulation space. • Circulation space must be generous enough to be occupied. • A cafe, project space and meeting rooms must be provided for shared use. • All parcels purchased will be cleared. 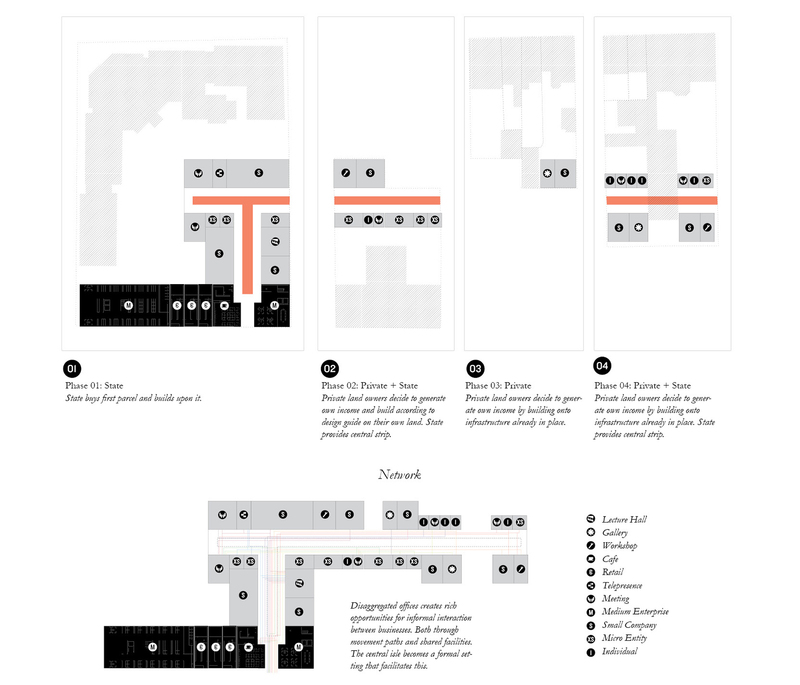 Three of the four Fundamental Types studied have been utilised for the design excercise. The lift core is extracted from the office tower, as a tool for overcoming the striation created by the fl oor plates. In a transformation as symbolic as it is instrumental, it is laid on its side and inserted into the historic fabric, activating the low-cost interior of the block. 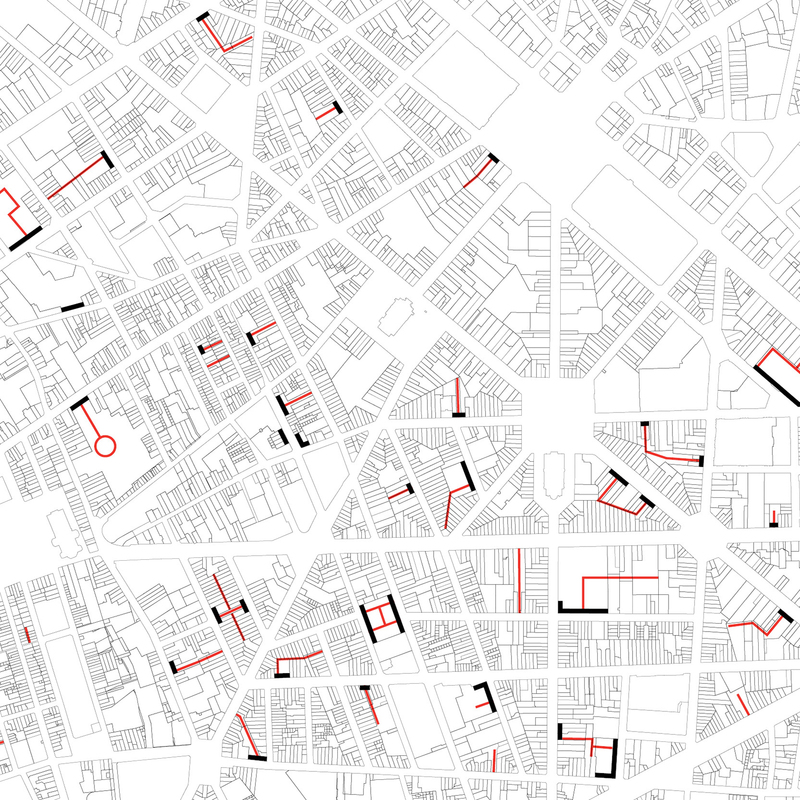 The couree is understood as a tool for colonising diverse cadastral parcels and for normalising a set of individual buildings in order to construct a collective identity around a void/laneway space. The Dom-ino Offi ce is a paradigmatic example of the predominant offi ce type in Lille. It is marketed as an open plan space that can be fi tted out as needed. Minimal transformation is applied to this type. 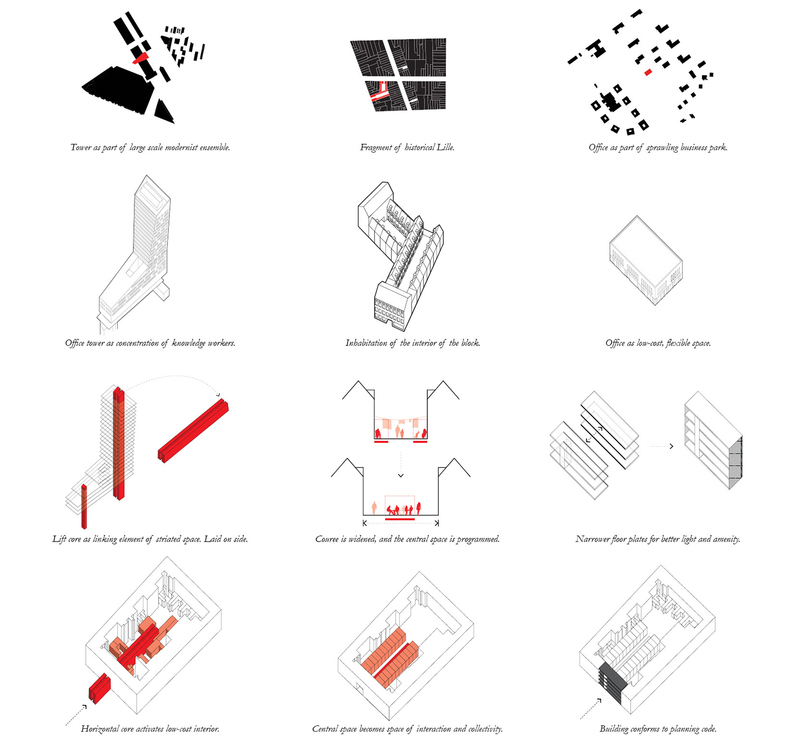 GFA is left constant, while the volume is transformed in order to conform to the planning constraints of a perimeter block.